Home Blog Post So… this just happened. 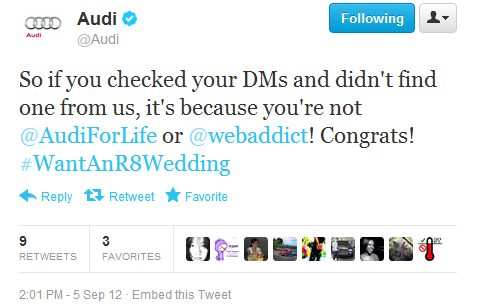 That DM that Audi is referring to is the notice sent out to the two winners of the latest round of the #WantAnR8 contest. Yep… I’m one of the two winners! I received the DM a couple of days ago and today’s tweet has made it official. As you can very well guess, I am completely and utterly ecstatic right now! Right now, I am just waiting for a contact back to set the date and time of the delivery of the R8 for a weekend. The other choice that I had would have been to have the R8 experience at Audi Forum Sonoma. While that would be a truly epic experience, I would prefer having the R8 to drive through the mountains, valleys and coastline of Oregon. I will post updates as they come and will absolutely provide a full run-down of the experience, along with photos, of the weekend.